The baskets styles that are pictured below can be woven for you in the size and colors of your choice. Tina always has some baskets available for immediate sale. 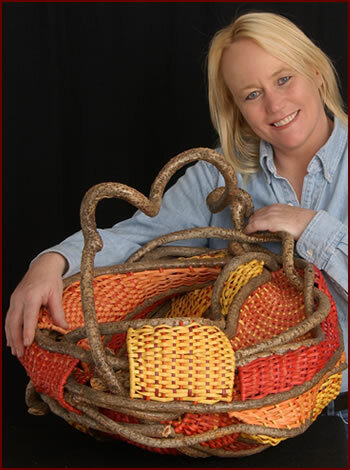 Please contact Tina directly to make a purchase or commission her to make you a custom basket. H 18" W 14" D 24"
A sleepy dragon's long neck swirls back creating a pouch surrounded by a fiery-colored body. The frame is made with bittersweet vine. The pouch is woven of reeds in colors reds, oranges, yellows and wine. View an enlargement of Dragon Pouch.